Our rates are lower than average due to, custom software, custom hardware, and a suggestive guiding algorithm. This results in ease of use, and higher production. We pass our savings to you, to make you more competitive. Our Telemarketing services consist of a live Call Center and a voicemail marketing component. 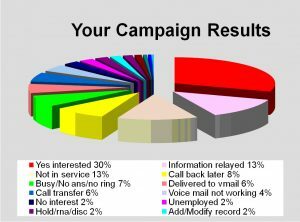 Your campaign may start within 48 hours, or same day, depending on resource staff. We guarantee a 100% call delivery rate, on every call. This keeps your throughput HIGH, and your costs LOW. All staff members reside in North America, and speak excellent English. All our software is built in-house and is adjustable to your specific campaign needs. Need assistance with your sales script? Just ask, it’s free. Our rates are pay-per-call; you’ll know in advance the cost of your campaign. Alternatively, you may choose hourly billing instead. You’ll be on-top of your campaign, and know your costs in advance. You can receive your leads immediately as they are discovered; to greater increase your chance of closing. This is called Electronic Lead Transfer. Don’t select your Telemarketing service provider until you get a quote from us.